Atlantis Dubai Hotel is one of the most iconic hotels in Dubai, and still wildly popular. Whether it’s because of its prime location at Palm Jumeirah, its stunning range of facilities (aquariums, water parks, beach clubs) or abundance of amazing restaurants, it never fails to impress. However, perhaps one of the biggest attractions is the abundance of Special Offers and deals available for Atlantis Dubai hotel. Here’s how to bag some of the best Atlantis Palm Jumeirah offers, whether you’re a Dubai resident or visitor. What’s great about Atlantis Dubai Hotel? If you were to ask anyone what places in Dubai they’re aware of, Atlantis and Palm Jumeirah would feature in most people’s answers. Situated at the head of Palm Jumeirah, the iconic islands (or more accurately, archipelago), Atlantis Palm was built in 2008 by the Kerzner International Corporation. Similar in style to Atlantis Nassau, the luxury hotel is modelled on the lost city of Atlantis. I’d always wanted to stay at Atlantis The Palm, due to it’s iconic nature and reputation, and we were not disappointed. Aquaventure water park is always a favourite, and easily fills a day with a fun and frolics. The Lost Chambers Aquarium was far more interesting than we expected, and going scuba diving in Ambassador Lagoon was a real treat. We visited Saffron evening brunch, as we had friends over from Saudi Arabia. Our friends – first time in Dubai – couldn’t believe the vastness of the offerings, with entire kitchen areas offering buffets from India, China, etc. To add further value, some of the restaurants (e.g. Nasimi Beach and Saffron) are often discounted or on two-for-one promotions with The Entertainer. When we visited Nasimi Beach, we also received a free bottle of wine with the meal courtesy of the Entertainer. We loved Saffron, especially because it was one brunch free with one paying customer, courtesy of The Entertainer. If anything, the only slight negative were the rooms were not as stunning as most top-end Dubai luxury hotels. Granted, we only had rooms – rather than suites – but they felt a tad dated, whilst still being very nice, comfortable and spacious. Atlantis often has promotions in the Dubai and international media and online, but the best deals are generally direct with the hotel. Deals can be obtained from third-party hotel and travel sites, or even using this travel hack to always find the cheapest hotel rates online. However, be careful – it’s often false economy to book Atlantis Dubai Hotel with third-party websites, as you’ll only save money on the room. As Atlantis is a resort, any money you save on the room could end up being spent on the restaurants or facilities. 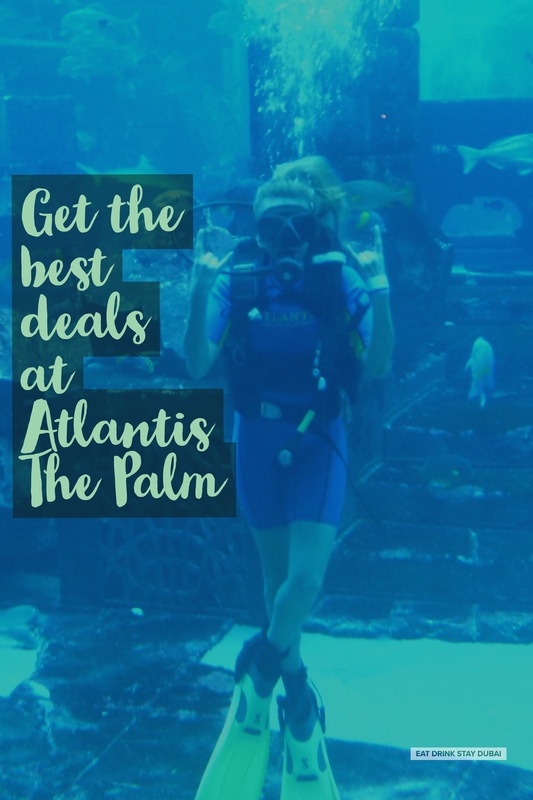 Far better then is to make the most of an all-in deal (if possible) such as one that offers discounts on facilities – such as free entry to Aquaventure or Lost Chambers. In some cases, booking direct can save over 3,000 AED per day inclusive on added value benefits in fact. Without a doubt, the best way to get the best Atlantis Dubai deals is to book direct – by using any of the graphics/banners on this page or via this link. ** note: offers as of 3rd November 2017. Check Terms & Conditions carefully – offers may be restricted dates/locations. Disclosure: This post may contain affiliate links. If you purchase via them, EDSD may earn a commission – although the cost to you WILL NOT increase. Please be assured any affiliate partnerships are products I’m a existing customer of myself, and your kindness will help support the site. Have you ever tried Atlantis The Palm? Which part of the resort is your favourite? Join the conversation below by letting us know your thoughts on Atlantis Dubai Hotel, especially any great deals you snagged!